Mathcad’s polar plot operator lets you plot functions that do not lend themselves well to Cartesian (x- y) coordinates. A typical polar plot shows the value of a radial expression r versus an angular expression e. For example, you could use a polar plot to graph circular antenna patterns or electric field intensities around an object. 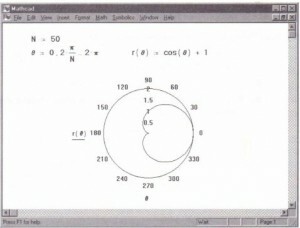 Mathcad draws polar plots by mapping rand e onto x and y using the standard transformations x = rcos(e) and y = rsin(e) . rand e can assume positive or negative values. You insert the polar plot operator into a blank space in your worksheet by choosing anyone of three equivalent methods: by choosing Graph-e-Polar Plot from the Insert menu, by typing [Ctrl]7, or by clicking the Polar Plot button in the Graph Palette. Like the X-Y plot operator described in Chapter 20, “Graphs,” the polar plot has placeholders on its axes for you to fill in that specify expressions to be computed and displayed, and it automatically chooses a default range for the angular axis variable if you do not specify one. In the case where you do not specify the angular axis variable, Mathcad creates a polar QuickPlot. .” • Enter the expression or function of a single variable you want to plot. Make sure the editing lines remain in the expression. 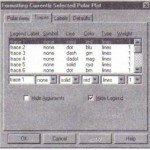 Insert menu. 120 60 Press [Enter] or click away from the 30 • graph. 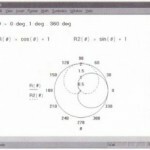 • First choose Graphee Polar Plot from the Insert menu and then enter an expression in the radial axis placeholder. • Click where you want the polar plot to appear. 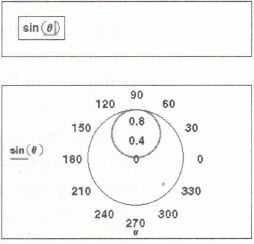 • Above the plot region, define an angle 8 and a function of the angle, r(8). • The bottom placeholder holds the angle variable to plot against. Enter a range variable or any expression involving a range variable in this placeholder. • The left placeholder holds a radial expression to plot. • The two placeholders to the right hold the upper and lower radial limits. Mathcad fills in these placeholders by default. If you want, you can modify these limits. See the section “Formatting the axes” on page 498. 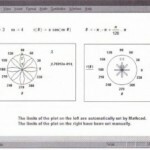 Just as with an equation or other plot types, Mathcad will not process the polar plot until you click outside the plot. You can specify many of the characteristics of the polar plot including the size, the number of grid lines, and the upper and lower radial axis limits. The procedures for specifying these characteristics are described later in this chapter. • Define a range and an increment for 8. 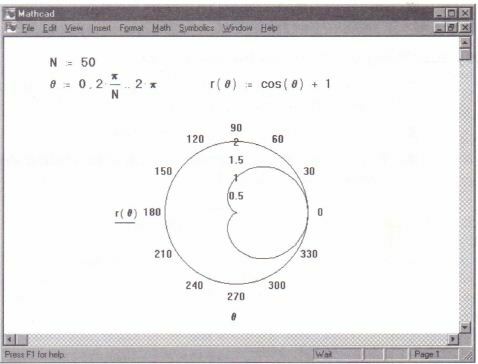 If you don’t, Mathcad generates a polar plot over a default range of 0 to 360 degrees. • Define r(8), a function of 8. • Show r(8) in a polar plot.